Do not worry about renting a car in Barcelona! The map of the city is very clear and it will be easier to cover with our rental tips. Barcelona is a city that can be visited perfectly by foot, looking at the tiles designed by Gaudí. But there are many areas with slopes, distant attractions (from Tibidabo to PortAventura) and coastal and mountain towns that you should not miss. Because of this, it is clear that getting a rental car in Barcelona is more than necessary. Depending on how you get to the city (by plane, train or boat), you'll be interested in getting the car rental in Barcelona closest to your arrival location. We have created these guides in which we provide you with all the information you need, from which rental companies operate in each place to what you should take into account when renting. So tell us, do you get to ...? Because we know how important it is to find out all the details about renting a car and because each city is different, we present to you below everything you need to know before making your car rental in Barcelona. What seasons have the highest demand for car rentals in Barcelona? As in the rest of the most tourist destinations in Spain, the city experiences an increase in visitors during the Easter and the summer months, so the price of car rentals in Barcelona tends to rise as these dates approach. How long in advance should you book a rental car in Barcelona? The offer of car rental agencies in Barcelona is one of the largest in the country. Although it is likely that you will always find enough cars to compare throughout the year, if you book in advance you can save a lot and find better opportunities. Keep in mind that the pace of travelers to Barcelona, ​​for business and tourism, is constant throughout the year. To play it safe, you can make a reservation even six months in advance, without having to pay the entire price until the date of your trip. And being able to change it until a few days before if you find a better offer. Are there many queues and waiting times at car rental agencies in Barcelona? Both at the El Prat airport and the Sants train station, the wide variety of offices means that, on average, the waiting times are short, between 10 and 30 minutes. This depends on the time during the day in which you approach to them: at peak hours, weekends, holidays and high season there is much more activity and waiting. You can expect queues of up to 1 hour at the counters of the low cost agencies since they have a bigger demand. Is there a price difference between different offices of the same rental company in Barcelona? As all the main points of car rental in Barcelona are in high demand, there is a great price and competition struggle. This causes price variations even between offices of the same company. That's why we recommend that you compare: most of the time the difference may be minimal and it's not worth moving to another office, but in some cases it might mean saving between 25% and 50%, which is great on any trip. To show you the differences, we have compared the rental price of several models of cars for five days in the three major car rental centers in Barcelona: the airport, the Sants station and the city center. What is the maximum possible duration of a car rental in Barcelona? This is not a problem in a city with as much offer as Barcelona. In addition, the more days you rent the car, the cheaper the price per day (and also the price per day of all-risk insurance and other additional coverages). However, the variety of car rental models is reduced as you want to rent a vehicle for a longer period. Renting companies often need to rotate the circulation of their cars among their clients, since companies renew their cars each year and the mileage accumulated in a vehicle reduces the subsequent sale price. For this reason, if you were interested in renting a car in Barcelona for 3 months, for example from May to July, at the Sants station only Enterprise would offer you a choice between two different minivans such as a Citroën Berlingo or Iveco Daily, at a cost between 2,000 and 2,500 euros for 3 months *. At the El Prat airport you would find a little more variety, the cheapest being a Fiat 500 for €1,693 with Firefly for three months *. * Prices calculated on 08/28/2017 for a 3 month rental in 2017. Carefully pay attention to how many miles are included in your rental: the more days you rent, it is predictable that you will need more miles. Without unlimited mileage included, extra miles can greatly increase the final cost of your rental. What kind of car is best to rent in Barcelona? If you are going to move often around the city, between the scarcity of parking and the risk of minor accidents, the safest thing is to opt for a small car. In addition, it will be very handy to move to other coastal locations where parking is not easy either. If you travel with many children or relatives, a minivan can be the most comfortable and profitable for excursions to small towns, but it will be practically impossible to park on the streets of the big city. If you are going to visit any of the mountain or forest areas that abound in the province, then you can choose a slightly more resistant model, although off-road vehicles are usually more expensive. Some companies also offer luxury cars, convertibles or more striking models such as the Mini, if you want to fulfill the dream of traveling along the seafront with the wind moving your hair, but bear in mind the risk of parking it in open areas. If you rent a car or SUV to drive through the mountains or wooded areas, especially in rainy season and mud, give a manual wash to the vehicle before returning it, because if the agency sees it very dirty they can charge a cleaning fee up to €100. Is it difficult to find available parking in Barcelona? Barcelona is among the European capitals where it is more difficult to find a place to park. In addition, it is normal to find closed streets for works on public roads. This translates into miles and gasoline spent driving around, impatience and drivers more likely to hurry and cause friction. If your hotel or place of residence does not include a garage, go with a prepared parking plan. The blue and green parking areas have time constraints and a high demand on weekdays, although they usually have more free spots on Sundays and in August. On Sundays it is also possible to park for free in some bus lanes: check the sign that indicates it. In the areas of loading and unloading, marked with yellow zigzag in the conjunctions between streets, you can park on weekends and holidays for free and without time limit. Free zones abound in the most remote neighborhoods of the center, such as Montjüic, Poble Sec or Pedralbes, or shopping centers such as La Maquinista, but you will have to travel by public transport and it is better to park in a safe area. Private parking lots are expensive, so depending on the parking time you need, think about other solutions that make it easier for you to park your car for a standard fare. On what special dates is it more problematic to rent and drive a car in Barcelona? Since December 2017, restrictions on traffic will be applied in Barcelona due to pollution alerts, as it happens in Madrid. Stay alert on this news if it affects you during your trip and you need to move around the downtown area. Holidays in the city of Barcelona are numerous throughout the year and involve extensive street closures. Each neighborhood has its own parties, and if they find your car parked when it is time to clear the area, the crane will take it. 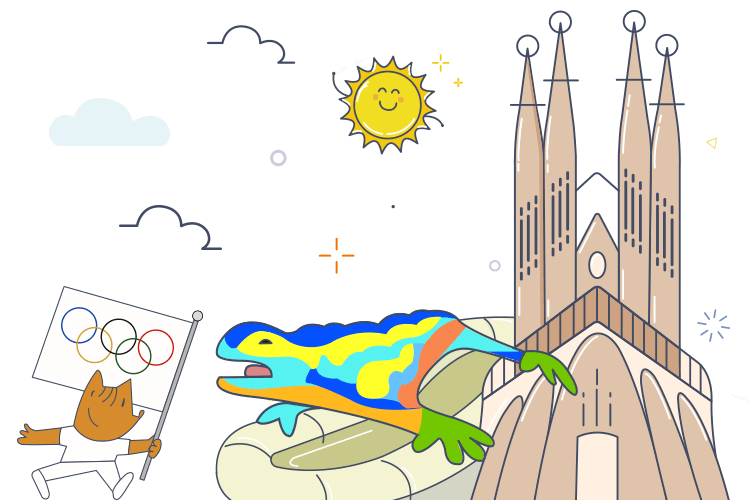 Festivals such as Sant Jordi, Sant Joan and la Mercè are not taken as a joke in Barcelona, ​​and practically the entire center will be closed to traffic and parking during those days. Both in those days (especially in the Sant Joan revetlla, with the bonfires that take place inside the city), as well as in the Diada de Catalunya and days of demonstrations, take special care when leaving the car outdoors, for the disturbances and damages that could be caused. Let's say you're enjoying a vacation in Barcelona, ​​but you only need a rental car one day to go and visit your grandparents in Sant Pere de Ribes (where there are no commuter trains). What is the cheapest 1 day car rental in Barcelona? If you rent a car at the train station in Sants, picking up at 8 in the morning and returning at 22:00 at night, with the company Enterprise you could rent a Ford Ka for 4 passengers for €47 (and €150 lock) *. If you were more passengers, with Alamo you could have a bigger model like an Opel Corsa for €51 *. * Prices calculated on 08/30/2017 for a one day rental of 2017. If you need a large capacity vehicle, evaluate well whether it is convenient for you to rent a big, but more expensive car (usually from €75 per day), or rent two cheaper smaller cars (but with the cost of two insurances), if you travel with several drivers. Knowing the opinion of customers who have already rented a car in Barcelona with us, is very useful to get an idea on how the car rental companies in one of the largest cities in the country work. Alamo Barcelona: The extra charges at the counter were at a different price from the reserved one. Cars are in good condition and we had no problems in the return. Centauro Barcelona: Variation between the reserved model and the one we picked up at their office. Car in good shape. Firefly Barcelona: Great price variation over time. Good customer attention in response to flight delays. Affordable prices. Thrifty Barcelona: A lot of persistence to sell extras at the counter. Unfriendly staff. Mari Ángeles Gómez Rented with Thrifty in May of 2017 The staff was too pushy to sell extras and not very friendly. I was determined to not let them affect my vacation when it was just starting. Book in advance, especially if you plan to travel in summer and holidays, as the prices become more expensive and the smaller, cheaper and most demanded cars sell out quickly. If you arrive by plane, compare the rental prices between the airport offices and the Sants train station, since there are usually cheaper deals at the train station. If you arrive on a cruise or boat to Barcelona, ​​in the port area there is not a lot of variety of car rental agencies, so evaluate if it's worth traveling to Sants or another neighborhood of the city. Do not get lost: at the El Prat airport there are rental agencies in both T1 and T2. Try to book at the most convenient terminal for you and write down well where you should go to. Do not risk it: the low cost agencies outside the airport have very appetizing prices, but in exchange you will have to give up a card hold of up to 1,000 euros if you do not choose the premium insurance. Compare the prices: it can be more profitable to rent directly in Barcelona capital than in rental agencies in many municipalities of the province. We recommend a full risk coverage because the traffic in Barcelona is intense and has the highest accident rate in Spain. Get all the information you can about which are the safest neighborhoods to park your car outdoors, and never leave any valuables in sight. Watch where you park: in many areas of the center, parking is reserved exclusively for residents. Be aware that tolls on highways in the province of Barcelona are among the most expensive in Spain. If the crane withdraws your car, save yourself a trip in and consult before by telephone to which of the 5 municipal car impound of Barcelona you must go to pick it up.